Embedding Wufoo forms on your Wordpress blog or site is easy with our Wordpress plugin. Hey, hey, hey! We’ve got a new embed snippet available in the Code Manager to help our friends on the WordPress platform more easily embed your Wufoo forms safely and securely on your favorite blogging platform. 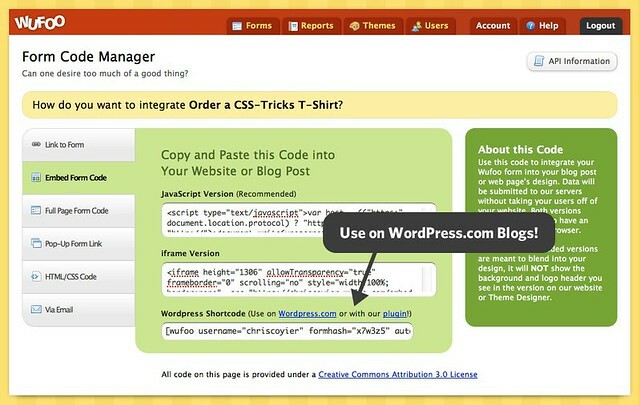 The new WordPress Shortcode snippet can be used in two ways: You can either use it in conjunction with our new WordPress Shortcode Plugin or right away on blogs hosted at WordPress.com. Thankfully, the WordPress guys have a wonderful API to allow services to create shortcode versions of their snippets that can be used safely. What’s a shortcode? As you can see it’s a lot easier to understand than our other snippets and very simple to adjust to your needs. If you wanted to say, hide the form title and description, you can just set that header="show" parameter to header="hide" and BAM! you’re ready to rock like a 18th century French aristocrat. Many thanks goes out to Evan Solomon over on the Automattic Team for helping us get this integration up and going so quickly. You are a wizard and a gentleman. If you want to use these shortcodes on your own WordPress installations, just install our WordPress Shortcode Plugin on your blog and then you’ll also be ready to rock. For old school manual installation people: copy the folder “wufoo_shortcode” into the /wp-content/plugins/ folder. Then go to the Plugins area of the Admin and activate. 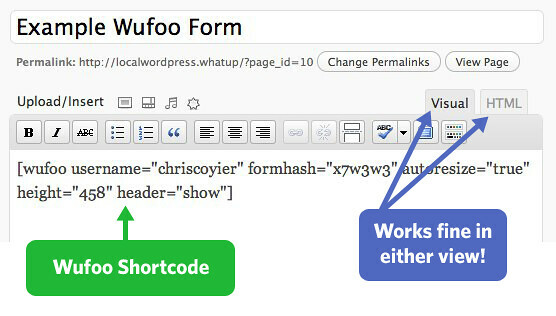 Otherwise, search for Wufoo Shortcode Plugin from the admin area of your WordPress site in Plugins > Add New.